I'm listening to the State of the Union address right now. One of the big reasons I'm listening is that I'm one of those people that feels the need to be informed. I wanted to hear what was going to be brought up. What are Obama's priorities? What will he name? What does he want to address? Those are things I want to hear. I'm also a fairly liberal guy. I voted for Obama. I still want to see his priorities succeed, mainly because they are also my priorities. But something else is happening as I listen. I think that I've been feeling down lately. It seems like there are constant problems, chipping away at my energy to make a focus. I thought that no one cared about the same things that I did. I felt incredibly weighed down by burdens. But as I listen to this address, I realize that my problems don't seem so bad when I listen to what others are working on. I'm certainly not a young woman in Afghanistan struggling to go to school. I'm not one of those unemployed people, wondering if I'm going to get another paycheck. I'm not a victim of earthquakes in Haiti, hurricanes in New Orleans, or even the cold of Minnesota (because I have a nice warm house to live in). I am blessed, and I think I needed to hear President Obama talk about what's going on out there to make me realize it. For that, I say "thank you". Thank you to teachers who help bring people out of poverty by providing education. Thank you to volunteers who give time and talent to organizations that helps those most in need. Thank you to social workers who spend time with people that most of us want to avoid. Thank you to military personnel who struggle and fight in foreign lands to keep us safe in our own land. Thank you to clergy who provide spiritual guidance through the daily struggles of life. Thank you to police officers and firefighters who keep us safe at home. Even thank you to politicians who work for a better society. Thanks. Your work sustains my work. Part of my motivation for starting this blog, oh so many years ago, was that I wanted to improve my writing skill. When I began this blog, I was also writing a column for a local GLBT paper (that quickly went under!). The editor was very patient, but I think he recognized that I didn't quite have the knack for spinning a tale with the right amount of detail that would draw a reader in. I guess I also recognized that deficiency, and I wanted to improve it. For a long time, I had considered myself a good writer. My main run-ins with reality had to do with major academic papers. My college thesis was a mess. I knew it. My readers knew it. According to the teacher, I did fine because I "honored the process" and went through all the steps. The problem was that I still produced a piece of crap through all those steps. My master's thesis was just as bad. This time, my teachers recognized the problems and sent me back to rework my papers. With the help of a brutally honest friend (who was also a gifted writer and editor), I was able to present something that was worthwhile. Since then, I've applied for PhD programs twice, both times rejected. I have a hunch that the essays that I've written and the writing samples that I've submitted have not really been up to par for the schools. Then, there is this blog. This is certainly not academic writing, but it is writing. It's storytelling. It explores one little idea, one day at a time. There are some posts that I'm particularly proud of, and there are others that I threw up there just to say that it was updated. One of the best blog writers that I've appreciated is Zombie Fights Shark. I think that guy can spin a tale or offer an opinion in the funniest and most provocative way possible. Granted, he does swear a lot (a LOT), but that makes it funnier. I've been reading him for a while, and he is going in and out of blogging right now. However, he is the sort of writer that I could enjoy doing. So here I am, on this blog. It is what it is. It has a few readers. Some of you appreciate it (hello Grandma!). Others have come and gone. I should say now that I appreciate anyone who reads and offers comments on this blog. Your feedback has helped me feel better about this offering that I've giving to the blogosphere. Where do we go from there? Who knows. But I'll keep trying. Today is the day we remember and commemorate the life of Dr. Martin Luther King Jr. This is also the first time that I've had the day off from work. When I worked in an academic setting, the opted to keep the college open, not hold classes, but also hold a convocation that addressed the themes of Dr. King's life. The speakers were great, there were often schoolchildren who would attend. A local chapter of Alpha Phi Alpha would perform a stepping routine (this got quite popular). The understanding behind the day was that we needed to have a day "on", not a day off. So, here I am at home from work. I'm not at the college anymore, so I don't have a ready-made convocation outside my office door (quite literally). How do I best honor Dr. King? One popular option is to spend this day in volunteer service. It's a good time to visit a shelter, a thrift store, somewhere that will work for peace and justice. Since I already work with a few non-profits, it may be a good time to continue the work there. I've been behind in getting information about The Naming Project Summer Camp out there. I've almost got a brochure completed, and I need to update the web site with this summer's dates (July 18-23, just in case you were wondering). I may also crack open my work laptop and do some more work. Again, I feel like the work that I do does advance a greater understanding between individuals. It's still a day "on" (even though I slept in today). I keep thinking about "peace and justice". In some ways, the idea of peace and justice is big and amorphous. It seems way more than we can do. It is beyond the work of an individual. It also encompasses so many aspects. Are we talking about peace and justice for race? class? gender? sexual orientation? ability? the earth? war? crime? community? Yes, yes, and yes. Because peace and justice is such a big term, we can work on any part of it. We don't have to solve all the problems of the world. We simply need to do what we can to make this world a better place. That may mean working in human relations (race, class, ability, gender, etc). It may be becoming a stronger environmentalist. It may be working within the political system. It may be volunteering at the local library. This is the best part: YOU GET TO CHOOSE YOUR OWN ADVENTURE! 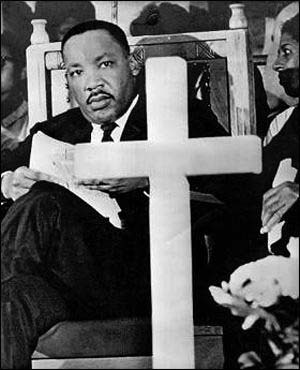 Most people think of Dr. King as primarily someone who worked for the rights of African-American people. Surely, most of his work was centered around race relations. However, later in his life, he began looking at poverty. He understood (as I am beginning to understand) that discrimination doesn't happen in a vacuum. Poverty is just as much of a problem for humankind as racism is. In fact, the two probably feed into one another. In order to help eliminate racism, Dr. King recognized that he needed to address the needs of the poor (regardless of race). And many of the poor suffered from racial discrimination, which implies that we need to eliminate racism to achieve real results in decreasing poverty. The cycle continues. Those are the thoughts that are filling my head on this MLK day. As I work on The Naming Project brochure, communication for TNP, and comforting those who still feel excluded from the church, I hope that I can help honor the legacy of Dr. Martin Luther King Jr. Please strive for justice and peace today, and every day. So, maybe I'm interpreting too much, but it seems like the roads are in much worse condition than they have ever been before. I only started commuting to St. Paul to work last February, and it is possible that there wasn't a significant snowfall that stayed very long. Well, in December, we had a big snow (in fact, we had a couple). After the snow in mid-December, there was dirty snow and slush all over the streets. I'd sort of slop through it to get to work. I just assumed that St. Paul had a really crappy snow removal system. After the Christmas snow, it got really cold. The snow that got packed down just turned to ice. Instead of driving through slush and slop, I'm sliding across whole blocks of sheer ice (with holes in it). I can't help but wonder if the road conditions has anything to do with budget cuts, and the inability to remove all the snow after a major snow fall. I've been hearing on the news that snow removal is being cut to the bone. Perhaps I'm driving on our budget cuts. I've spent nearly two weeks with my family. Everyone was here, from my eight-month old niece, to my 81-year old grandmother. We spent Christmas at my house (a first for me). Them more exciting part came after Christmas. We loaded up on an airplane and headed to Puerto Rico as a family. And we had a WONDERFUL time! We stayed in Ponce. It's the second largest city in PR, on the south side of the island. It was really a pleasant city. We stayed a resort with a pool and a beach. My grandmother could be pampered (by us and the resort staff). My niece could nap when she wanted and go out with us as well. Richard and I drove around the city quite a bit. We had to get two vehicles, so Richard and I were the drivers for the whole group. The trip was the Christmas gift from my parents. Richard and I gave the gift of a snorkeling trip. My sister and her husband gave us all massages (or, we used the massage service in the resort). My grandmother paid for nearly all the meals. It was a great time, sharing a lot of the expenses.